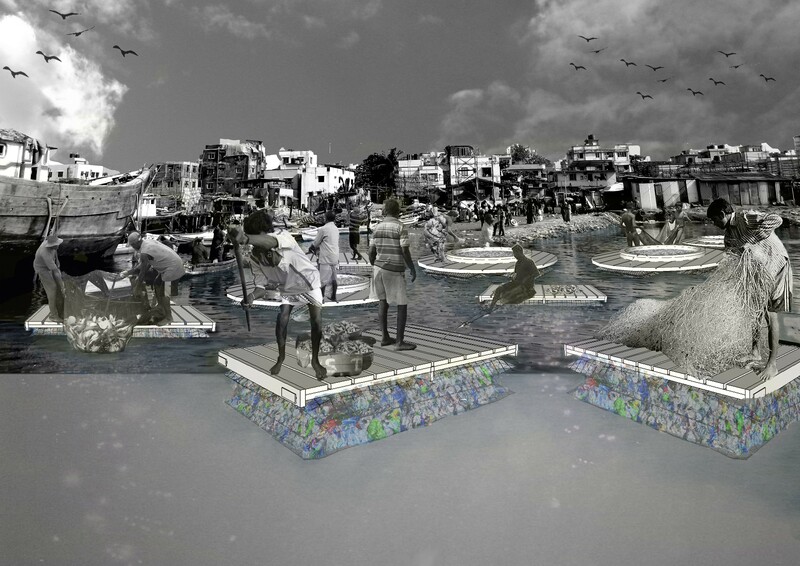 A prize winning proposal to recycle plastic waste along Mumbai's coastal village of Versova, uses fishing nets and the involvement of the local fishing community. 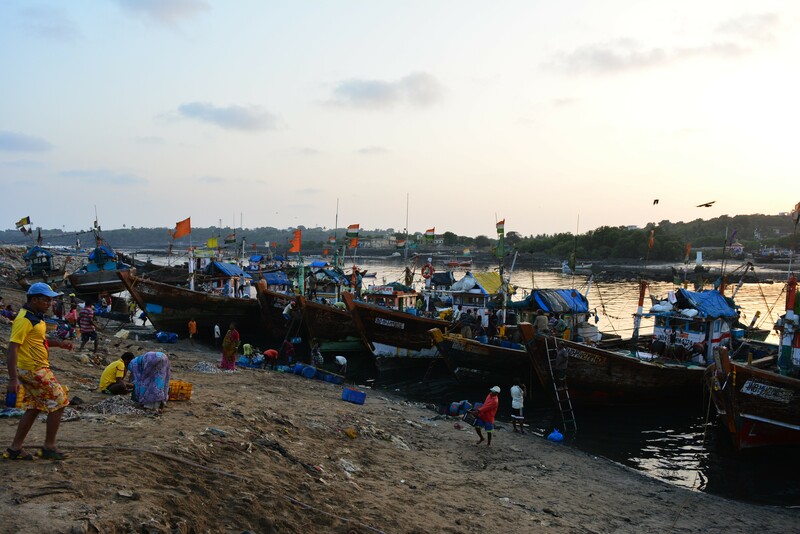 Jai and Ketaki of urbz Mumbai have drafted a project for Versova Koliwada, a historical fishing village in Mumbai. The project was submitted to Shelter Global’s international competition “Dencity” and just won the 1st prize! Shelter Global is an interdisciplinary, not-for-profit organization focused on solving the world’s shelter crisis by providing safe, clean living conditions for everyone. The project deals with a number of critical issues relevant to the Koli community of Mumbai. The Kolis, a fishermen community, are some of the earliest inhabitants of the city, having lived here even before it was named Bombaim by the first Portuguese colonisers. These fisherfolk, known for their convivial way of life, live in small settlements spread across Mumbai’s coastline. The Versova Village is one of about 38 Koliwadas in the city. Mumbai’s urban villages, which include the Koliwadas, are only vaguely acknowledged under the Gaothan Act. Yet, they provide its residents with affordable costs of living and livelihood opportunities. Mumbai’s population has grown tremendously over the past century, and urban villages have densified and spread accordingly. Today, many of them are mistakenly considered as slums. The Kolis of Mumbai have been fighting for recognition and opposing the redevelopment plans of the government. urbz has always supported Dharavi-Koliwada’s efforts to be excluded from the Dharavi Redevelopment Project. 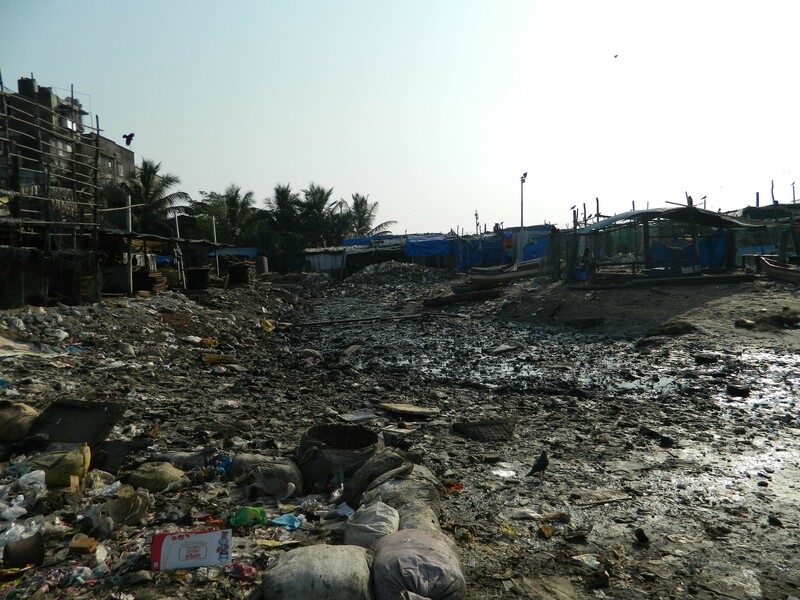 Versova-Koliwada, situated along the Malad Creek, is a lively village with 50000 inhabitants that is now classified a slum by the government. The community of Versova-Koliwada has managed to thrive in harmony with the help of various existing activity centers and ancillary industries. However, deteriorating environmental conditions have compelled the Kolis to migrate and look for opportunities outside their settlement. The industrial effluents and solid waste, especially plastic debris from the neighborhood, pollute the 19 km long Oshiwara River before it enters into the creek. Due to the nature of the water current, the solid waste eventually settles on the banks of Koliwada. During monsoon, mountainous heaps of plastic debris accumulate on the coast. As a result, the nearby, polluted mangroves experience a loss of cross-breeding. The consequence of this extreme pollution has brought about an increase in the fish mortality which negatively impacts the livelihood of the fishermen. These actions affect the local economy, allied skilled occupations in the hamlet, and fuels ecological concerns. The proposed four-phased intervention encompasses a number of critical questions and tackles two major issues: integration and sustainable development. The intervention intends to blur the existing social boundary between the kolis and the city dwellers, and effectuate an integration across various levels: social, economic, spatial and political. This proposal wishes to address the issue of an ‘unseen future’ of these communities by exploring different methods that can sustain their existence and propel it forward in an exemplary environment-friendly manner. The first phase aims to inaugurate a ‘Knowledge Center’ with the support of the already established Versova Co-operative society. This center proposes to facilitate new activities and services based on the principle of micro-intervention. One of the major pollutants responsible for the coastal and mangrove degradation is plastic debris. The first step of this phase designates focal points for waste collection and segregation. 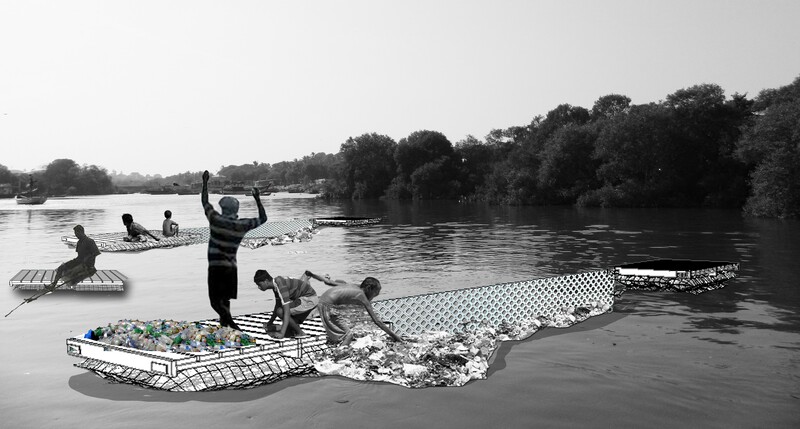 The center would use the skills of the net weavers to make filter screens, suspended 2 meters deep in the creek and anchored along the edge, imitating a water filter system. This ensures uninterrupted movement of fish while creating an efficient method for waste collection. The plastic debris collected from a comprehensive waste sorting would be recycled and repurposed. The technology of ‘Plastic Boats’ will be used to make a ‘Poor man’s boat.’ This is a float which is made of plastic gunny bags with three compartments. They are filled with empty, used plastic bottles and stitched together to make a homogenous mass. Its design and the air in the empty bottles allow it to float, much like any inflatable swim tube or ring. The proposed floating island would benefit and prolong the lives of the mangroves and corals. A floating island of a base diameter of 18 m consists of two components: plastic nets made of tied bottles and a wooden board. This technology is presently used to build inflatable tubes/rings for closed system aquaculture. The second phase aims at introducing to the creek a closed system aquaculture, one of the most environmentally conscious methods of rearing aquatic species. This would increase the fish population, help the fishermen in increasing their catch and strengthen socio- cultural and economic sustenance. The third phase focuses on uplifting the economy and supporting the fish market by introducing ‘Inland Fish Culture’ where fresh water and ornamental fish breeding is carried out. The final phase aims at setting up a Fish Processing Industry. This expansion would extend Koliwada’s economic reach to the city, establishing a socio-economic interaction between the two. This phase also includes setting up a restaurant, an aquarium and an information center. Creation of spaces designated for workshops and exhibits of local fish produce like the popular dry fish pickle, especially during the yearly Versova Seafood Festival, are also proposed. The proposal is envisioned to have a ripple effect across the various Koli communities of Mumbai. The ideas in this project could potentially be duplicated in different Koliwadas with the Versova-Koliwada as a starting point. The interventions in the project use technology as a means to empower local business and strengthen ties both within and outside the Koli community. Finally, the project hopes to erase lines of social division between the city and the ‘slum’, looking at both as one mutually beneficial and interdependent entity. The urbz team is now looking forward to engaging with the Koli community at Versova to bring the project to life. The main goal of the Dencity proposal is to incrementally develop the existing ancillary industries, stimulate employment, and encourage the germination of more small-scale industries. The projects hopes to highlight existing skills sets and incorporate clever use of technology to enhance the social, economic and cultural state of the entire village. Get in touch with Jai and Ketaki for more information about this project.